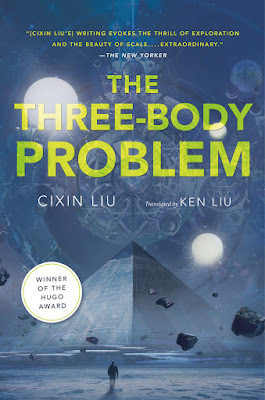 The Three-Body Problem follows three narrative threads. The first takes place in the middle of the Chinese Cultural Revolution where Liu sows the seeds of the main characters' motivations. The second thread occurs in the present where nano technologist Wang Miao suddenly begins to see a countdown displayed wherever he looks. With little idea what the countdown means, but knowing that there has been a recent spate of mysterious deaths among scientists, Wang immerses himself in an increasinly addictive virtual reality game called Three-Body. The third thread takes place on a distant world where aliens are searching the skies for a new planet they can colonize before their home planet is destroyed. This is a difficult review to write for two reasons. First, I listened to the audio version of the book rather than reading it, so I'm having problems spelling the names of the mostly Chinese characters. Second, and more importantly, this book made my brain explode! In the good way, not to worry. But it was intense and I'm having trouble getting my swirling thoughts to coalesce into a review that will do justice to this amazing book. Before reading The Three-Body Problem, I had never fully realized how U.S.-centric and Eurocentric the science fiction I typically read is. I loved that the Chinese sent their own messages out into space, so that the U.S. and the USSR wouldn't have a monopoly on alien contact. Few authors can handle both the epic sweep and individual character growth as well as Liu seems to. Societal forces like the Chinese Cultural Revolution have deep impact on several of the main characters and how they navigate the prospect of alien contact. The Three-Body Problem also made me think in new ways about standard science fiction tropes, like alien contact and the end of the world. We first meet the aliens in question, or at least some characteristics of the aliens and their world, in the virtual reality game, Three-Body. This was a bizarre and thoroughly engrossing part of the story for me. I loved watching Wang Miao's interaction with the other players. The world of the game is a bizarre one in which day time and night time are unpredictable for long periods of time (chaotic eras) and only occasionally follow the typical day-night-day-night cycle (stable eras) our world is familiar with. Suffice it to say, the aliens are sufficiently alien, and yet retain just enough similarity to make them terrifyingly recognizable. The Three-Body Problem rewards the patient reader (or listener in my case). The novel switches timeframes and has a number of extended flashbacks. I don't know if listening to the audio version instead of reading contributed to my getting a bit lost on occasion, but once I got myself straightened out this book was a contemplative and frightening delight. It's been weeks since I finished the book, and I still can't stop thinking about it!